One of the most typical Indian string instruments (especially in the south) the veena has always had a special place in Indian music, even if in recent years a dearth of players with the talent to break onto the international scene has consigned it to partial obscurity. For the Carnatic musical culture it has gradually become one of the most important means of expression Hailing from an artistic family, Gaayathri has gone from child prodigy to emerge as one of the greatest veena players, charming the public with her combination of innate ability and formidable technique. An unending crystalline sound flux issues from her instrument that manages to combine virtuoso playing with the fundamentals of the musical traditions of southern India. 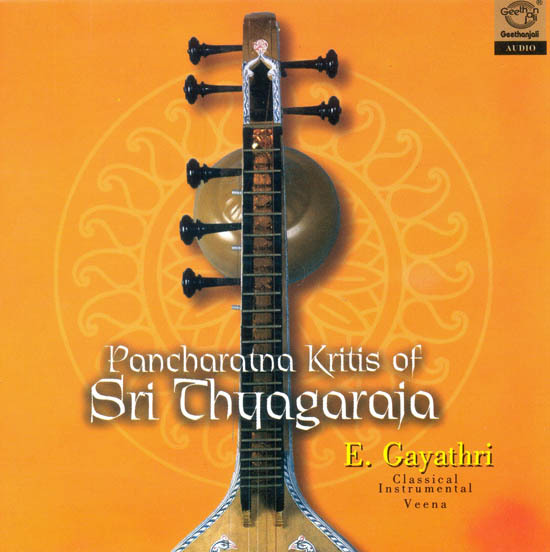 The child prodigy has gradually given way to a performer of astonishing maturity and strength in whom natural ease of touch is clearly fortified by the fruits of hard daily graft on the instrument, Gaayathri’s playing style is palpable on many of the tracks on this CD, twisting the sound of the veena into something that sounds almost human, unfolding all its lyrical, mesmeric power. Improvisational passages are always controlled to ensure the clarity of the melodic line. Permeated by the spiritual and devotional vein that runs through all Carnatic music, her playing shows how a great musician can get to the essence of the tradition. The sense of union with the infinite typical of Indian music as a whole is here perfectly exemplified. A feeling of serene exaltation arrived at through a constant search for a pure uncontaminated sound: the kind of sensation our society has long since ceased to look for and for which we are eternally indebted to the musicians of Indian who are able make it live anew day after day. The Veena is quintessentially an Indian, and particularly a South Indian Musical Instrument. In mythology, which in India is very intimately and profoundly connected with religion, it is the instrument of Saraswathi, the goddess of Learning. The Veena is so typical of South Indian classical music that even vocalists are recommended to learn to play it. The nuances and graces so peculiar to the system of Carnatic music, as it is called, are the hallmark of this fretted stringed instrument. In this rendition, Gaayathri draws her immensely rich repertoire to serve a repast of masterpiece melodies from any array of great composers.